This is the second volume of the famous Card College series. Volume 1 and volume 2 can be considered a unit, covering most important moves as well as most if not all crucial theoretical points. Each section describes a move or a group of sleights in minute detail, using carefully chosen words, beautiful illustrations and clear video clips. There are a total of 108 video clips in this volume. At the end of each section you will find some of the best and most amazing effects. The many video clips, some in slow motion, some from different viewing angles, will make learning difficult moves a breeze. 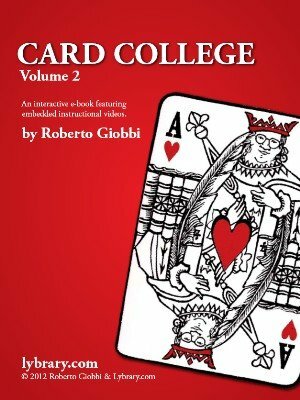 (If you are only interested in the video clips see Card College 2: Videos Only .) The theoretical section in volume 2 is outstanding. It is very detailed and would make by itself a marvellous book. If you master both volumes you will be an excellent card magician. Ask anybody about Card College and you will find that most will strongly recommend it. Roberto Giobbi's Card College has stood the test of time. It has been translated into many foreign languages and is probably the best selling magic publication of all time. This ebook includes the latest updates and additions by Roberto Giobbi, which were masterfully translated by Richard Hatch. 1st digital edition (HTML) 2005; 1st PDF edition 2012, 346 pages.